“Kathryn Is Lonely dot com”, which, I have to be honest here, I still find super clever and adorable. Janeway is a very hands on captain, and she readily blurs the boundaries between the personal and the professional, even on the bridge. But she holds herself deliberately separate from the crew in terms of romance and intimate relationships. The result is a ship full of messy, twisty, complicated relationships that bring up a lot of messy, twisty, complicated feelings. Which is a pretty good metaphor for adolescence. I related to B’Elanna’s desire to belong, and fear she never would. To Seven missing the Collective because it’s scary to be suddenly alone and responsible for yourself and your choices. To Tom’s need to prove himself. And to Kathryn’s isolation. I was lonely, too, and I wanted to talk about it. So I published my website, and then: I found fandom. I define fandom as a community of people united by passion for a certain something. But that is merely the foundation. A fandom tends to be less homogenous than groups united by age, location, ethnicity, gender, or similar defining traits and it encourages engaging with different perspectives. Creating, sharing, and critiquing fan works allows new authors and artists to grow in a comfortable and supportive environment divorced from the capitalist machine that dominates Western society. Fandom toxicity, gatekeeping, ship-wars – negativity exists, and hurts, but fandom can, and does, battle against it and strive to evolve past it, becoming more inclusive and more supportive, not less. The Voyager fandom didn’t only accept me, they encouraged me. I was most active in the subfandom dedicated to the relationship between Kathryn Janeway and Tom Paris, through a website known as JuPiter Station. I posted stories and art, participated in contests, and exchanged emails about Star Trek, and life, with people from all over the country. They were my collective. Three years ago, I decided to rewatch Voyager. When I got to the fourth episode, “Time and Again”, wherein the captain and her helmsman are sent back in time one day on a planet the ship found destroyed, all my Janeway/Paris feels flooded back. I decided to photocap the episode (recap the story by adding captions to screenshots) and post it to tumblr. It was a lot of fun, so I kept going. I’m currently in season three and starting Enterprise. Slowly but surely, I started to creep back into Star Trek fandom. But it wasn’t until the premiere of Star Trek: Discovery that I truly engaged with people the way I had as a teen. Like Captain Janeway herself, I’d imposed all these rules on myself for how I interacted with the fandom. I thought my blog had to post original content only. I’d fallen prey to the idea I had to have and be “brand.” But I chanced to see a post on tumblr asking for more information about the items on display in Captain Georgiou’s ready room and I not only had an answer, I had an emotional and familial connection to it. I grew up surrounded by shadow puppetry and East Asian culture and I cried when I saw it displayed in Discovery’s pilot. So I broke my arbitrary rule. I reblogged the post and told my story. And in that moment I realized I’d been going about everything all wrong. People didn’t respond to my photocaps because they were full of buzzwords or somehow marketable. They responded because they were full of love and somehow me. Through those photocaps, I’ve reconnected with the Voyager and the wider Star Trek fandom, and it has significantly improved my life. I write regularly — fiction, analysis, recaps, essays. I present at conventions and guest on podcasts. I’m studying Star Trek and psychology to complete my Master’s Degree. And I’ve not only met hundreds of new people, I’ve reconnected with people I knew when Voyager was on the air. 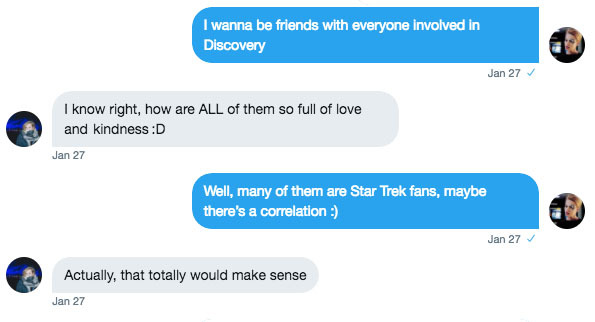 And through Discovery, and my beloved Admiral Cornwell, I’ve found another pocket fandom I can exchange stories and ideas with, participate in challenges and speculation, and chat about Star Trek — or anything else — at any time of the day or night. I’ve loved Discovery’s first season, but it also caused me a lot of anxiety, particularly centered around the fate of my Admiral. In between the episodes “Si Vis Pacem, Para Bellum” and “Into the Forest I Go” StarTrek.com published an interview with Jayne Brook suggesting Cornwell’s on screen death was real despite that making no narrative sense to me. I reacted very strongly, had an emotional breakdown. But the fandom rallied. We made plans to write all the fic, to fill in her backstory, spin off into alternate realities if canon cut us off. We would keep her alive no matter what. Through the character of Katrina Cornwell, and the community of devoted fans that cropped up around her, I found the strength to pull myself out of my panic attack over her alleged death. And by sharing how hard it hit me, I was able to give all that positive energy right back to the fandom. My personal and emotional life was in upheaval when Voyager ended and also when Discovery began. Through all that, I engaged with Star Trek because it gave me hope. But hope isn’t something to be hoarded, it’s best shared. The quotes used in this article are responses to a survey the author conducted through tumblr on Star Trek Fandom Positivity. All are posted with permission. Yes, yes, and also yes. I discovered Star Trek on reruns in college when I was way over my head in a new environment. I was already in fandom by then, but DS9 became my fictional family. These people who were so brave and decent and different from each other and who valued such a wide spectrum of life. And then Janeway–I joke that Captain Janeway made me gay–she was so instrumental in my realizing that all those inchoate feelings I had about women meant something non-heterosexual. Kira Nerys and Lenara Kahn and B’Elanna Torres too, but Janeway…was in a class by herself. And I don’t think I’ve fallen heartfirst into a fandom in years the way I have with Discovery. It’s partly Michael and what the show is doing with the “face the darkness and choose the light” themes, and it’s also Katrina Cornwell. I want to be her when I grow up. I want her on my screen forever, growling back at Klingons and hanging on by her fingernails and hopefully getting to be happy. And interacting with women–the women of Discovery have blown me away, not just as individuals but in how many of them they are and how they relate to one another. And of course as someone else said, my sexuality continues to be women over 35 in Starfleet uniforms. This show. THIS SHOW. And it wouldn’t be half as amazing without sharing it with the rest of you. Stories and meta essays and random discussion and just knowing there are others (mostly other women) out there with these same passionate feelings about all these things. I’m in love. I can totally relate to this. Admiral Cornwell’s character is the real reason I’m surviving my depression right now. Her strength in all trauma and loss she faces has made me realize that I too have the strength to go survive this. and her vulnerability and emotions taught me that I do not need to hide mine. I’m glad she is the best role model for my adult life. Thanks for the elaboration, Anika Dane.